If you thought the life of most musicians was comparable to the blissful and blinged-out existences of Kanye and Rihanna, you've clearly not heard much about our ever-desiccating music industry. According to the latest Nielsen research, only 2.1 percent of the albums released in 2009 sold even 5,000 copies — that's just 2,050 records out of nearly 100,000, and to fewer people than go to a small liberal arts college. As if that weren't bad enough, even the bands who do move units end up paying through the nose, mouth, eyes and ears for management, legal fees, producers and other expenses, leaving most of them scrounging to pay for record advances and, if they can afford it, health care. SLRP: The suggested list retail price of a CD is currently $16.98, while the standard wholesale price — what retail stores pay the label per CD — is about $10. Once the retailer gets the CD, they can sell it for however much they'd like — hence "suggested." Artist's royalties are a percentage of the retail price. Superstars can get 20 percent of the SLRP, but most get 12 percent to 14 percent. Packaging charge: 25 percent of the SLRP goes back to the record company immediately for what's called a "packaging charge" — that's the label literally charging the artist for the plastic case in which his or her CD is sold. Free goods: In essence, "free goods" are a roundabout way for labels to discount records so stores will be more inclined to buy them. So rather than sell Best Buy 100,000 records at the regular wholesale price, the label will sell them 100,000 records for the price of 85,000. The artist is then paid for the 85,000 CDs, not the actual 100,000 sold to the retailer. Reserves: Records, especially records by newer artists, are generally sold with the caveat that retailers can return to the label whatever copies they don't sell for a full refund. Thus to ensure they don't lose too much money on artists, record labels will sometimes pay artists for only 65,000 copies out of 100,000 copies, just in case 35,000 (25,000 if you consider the free ones) are returned. If the retailer ends up selling all their copies, the label will then pay the artist the balance owed, which can sometimes take years. Songwriter/publisher: If an artist doesn't write his or her own music, someone else has to. And someone who writes a song must first go through a music publisher, whose job it is to place that song with a recording artist who will agree to perform it. If an artist buys the song, the writer and publisher then receive 9.1 cents for every copy of the song sold, a sum they must then split. Personal manager: This manager guides the career of the artist and gets about 15 percent of the artist's gross earnings. Business manager: This manager is the artist's money man, making sure the musician repays his debts and invests his earnings wisely. A business manager charges 5 percent of an artist's gross. Lawyer: While it's not always the case-many charge hourly-some artist's lawyers charge 5 percent. AFTRA and AFM: These are the musicians unions. Singers join AFTRA (the American Federation of Television and Radio Artists), while players join AFM (the American Federation of Musicians). If an artist cuts an album, he has to join a union, which will then take $63.90 in base dues plus 0.743 percent of the artist's first $100,000. Record advance: Unlike touring fees, of which the record company can only recoup half, record advances are 100 percent recoupable. That means that if the label fronts an artist $75,000 to pay for whatever he or she needs to record an album—studio time, new instruments, etc. — the artist then owes the label that initial $75,000, regardless of whether the record is a success or not. The Root thanks Don Passman, author of All You Need to Know About the Music Business. Still want to get the band back together? 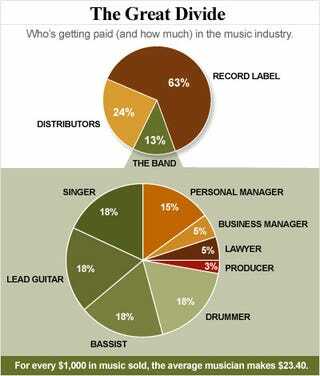 Crunch the numbers and see for yourself just how much you'd make as a musician.